The European Interest Group (EIG) meeting for STI cooperation with Japan hosted by Netherlands Enterprise Agency (RVO.nl) was held in The Hague on February 16, 2017. Approximately 30 people from 13 countries participated in the meeting. EIG for Japan is an activity of JEUPISTE and funded by the EU for the promotion, enhancement and development of Europe-Japan cooperation in Science, Technology and Innovation. This meeting aimed to discuss the future collaboration in this framework as JEUPISTE will end in February 2017. 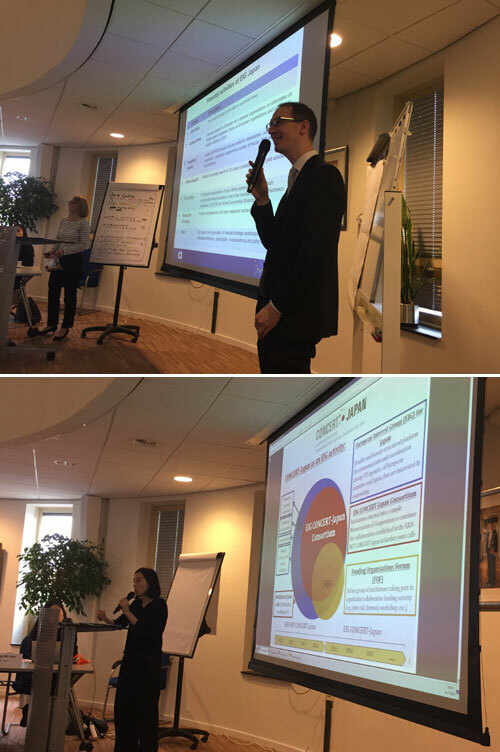 Its past achievements and future activities were introduced by Dr. Sabine Puch (Senior Project Officer, DLR PT) and Mr. Stijn Lambrecht (Project Manager, EU-Japan Center). The current activities of CONCERT-Japan were presented by Ms. Izumi Tsune (Research Coordinator, JST). Subsequently, the Kick-off workshop of EIG CONCERT-Japan Joint Call “Food Crops and Biomass Production Technology” was held on the same day in the afternoon and representatives from the 5 selected projects introduced their research. (http://www.jst.go.jp/pr/info/info1239/index.html). Dr. Fumihiko Sato (Japanese Program Officer for this program and Prof. of University of Kyoto) attended the meeting and contributed to the workshop by addressing valuable comments and advises to each project. AVRIST Conference "Japan, a country open to innovation"
An AVRIST Conference, titled "Japan, a country open to innovation" was held in Paris on October 19th 2016, organized by the AVRIST (Association pour la Valorisation des Relations Internationales Scientifiques et Techniques) in partnership with the Centre Jean Pépin, and supported by the Japanese Embassy in France and the JST Paris Office. The full-day conference hosted about 140 participants, including 30 speakers from both France and Japan. Dr. Pierre Caye, Director of the Centre Jean Pépin, Dr. Catherine Bréchignac, Ambassador for Science, Technology and Innovation in France, and Mr. Hiroshi Kawamura, Minister to the Embassy of Japan in France delivered speeches at the opening of this conference which were followed by two sessions and three round tables dealing with various areas of excellence in Japan. At the first session titled "The challenges of Japan" , Prof. Teruo Kishi, Science and Technology Advisor to the Minister for Foreign Affairs of Japan addressed themes in the session, including future directions of collaboration between France and Japan. Mr. Shiro Takegami, Director for SIP (Cross-ministerial Strategic Innovation Promotion Program), Cabinet Office of Japan followed by presenting the Japanese STI policy and gave a lecture on SIP, a new type of Japanese national project for science, technology and innovation. Mr. Masahiro Takemura, SIP Director, Department of Innovation Platform, JST, Dr. Kenichiro Tsuda, Senior Policy Researcher, Cabinet Office and Dr.Takayuki Ishizuka, Fellow, Department of Innovation Platform, JST presented each case projects implemented under SIP. The Scientific Committee and Funding Organisations Forum (FOF) meeting of EIG CONCERT-Japan was held in Paris on September 19 and 20, 2016. The European Interest Group (EIG) CONCERT-Japan is an international joint initiative to support and enhance science, technology and innovation (STI) cooperation between European countries and Japan. In the framework of the 3rd Joint Call of the EIG CONCERT-Japan closed on 27th July 2016, 14 project proposals were received and have been reviewed by online evaluators. Experts nominated by each participating funding organization met at the Scientific Committee, and ranked the proposals based on the online evaluations and internal discussion. Representatives of each participating funding organisation in the initiative met at the FOF meeting, and discussed to take the final decision on the project proposals to be funded on a consensus basis, based on the recommendations of the Scientific Committee and in consideration of available budget. The EuroScience Open Forum (ESOF) 2016 was held in Manchester, UK from July 23rd to 27th. The organizer EuroScience is a non-profit grassroots organization of researchers in Europe and its biennial pan-European meeting is dedicated to research and innovation. ESOF brings together over 4,500 leading thinkers, innovators, policy makers, journalists and educators from more than 90 countries in order to discuss current and future breakthroughs in contemporary science. Previously, the event has been hosted in many of Europe’s leading cities in order to enhance the significance of ESOF's activities and attraction of the city in relation to science, technology and innovation, such as Stockholm, Barcelona, Dublin and Copenhagen. During the event, JST introduced its overall activities with a special focus on a few highlights. The JST booth was organized by the Public Relations Division. Dr. Nakamura (Counselor to the President), Dr. Watanabe (Deputy Executive Director), Dr. Iwano and Mr. Arimoto (Principal Fellow) gave lectures at several seminars which are coordinated by the Center for Science Communication (CSC) and Center for Research and Development Strategy (CRDS). The network dinner meeting, which was co-hosted by the South African Department of Science and Technology (DST), was held on the occasion of this event. The next ESOF will take place in Toulouse, France in 2018. A site visit to Lyon in France was organized by the Chamber of Commerce and Industry of Japan in France (CCIJF) on July 19th 2016 to learn "Smart City Lyon" . Greater Lyon was elected as the first French intelligent city in 2013, and has managed to implement a Smart City strategy to combine economic dynamism with sustainable development. Participants from the CCIJF, including Ms. Nakayama (Deputy Director, JST Paris Office) visited part of the major urban projects sites by the city (Lyon Confluence, Lyon Part-Dieu) and learned the "Smart City Lyon" process by exchanging of opinions, questions with officials of the Greater Lyon. "Today, I work with researchers in various countries including Japan and Europe, as well as the United States, Egypt, and Singapore. London serves as a hub in this sense and collaborative research relationships can expand dynamically here – this is one of the points that I find interesting about conducting research overseas." On the occasion of the "Year of France-Japan Innovation 2015-2016" , Séminaire franco-japonais en faveur de l’innovation (France- Japan Seminar on Innovation) was held in Paris on June 21st 2016, co-organized by the Japanese Embassy in France and the MCJP (Maison de la Culture du Japon à Paris) to present various tools and programmes open to companies and researchers, and to share good practices in this field. At this Seminar, Mr. Kato (Director, JST Paris Office) made a presentation and introduced achievements of research collaborations with France, including recent joint call for proposals that were launched in cooperation with the ANR (Agence Nationale de la Recherche). "Empowering EU-Japan Science, Technology and Innovation Cooperation" was held in Brussels on June 9th 2016, organized by some members of JEUPISTE project (EU-Japan Centre for Industrial Cooperation, APRE, Kobe University) aimed at facilitating STI cooperation between Europe and Japan. Ms. Nakayama (Deputy Director, JST Paris Office) presented an overview on JST’s activities and its global activities focusing on the STI cooperation between Japan and EU as one of key Japanese research funding agencies. At the Seminar, current joint call for proposals in the field of "Food Crops and Biomass Production Technologies" within the EIG CONCERT-Japan was also promoted to the participants. JST-CREST "Creation of Fundamental Theory and Technology to Establish a Cooperative Distributed Energy Management System and Integration of Technologies Across Broad Disciplines Toward Social Application" (Research Supervisor: Prof. Masayuki Fujita, Tokyo Institute of Technology), the NSF (National Science Foundation), the DFG (Deutsche Forschungsgemeinschaft) and the RCN (Research Council of Norway) jointly held the 2016 JST-NSF-DFG-RCN Workshop on Distributed Energy Management Systems in Heidelberg, Germany. "I always feel that nothing can start if you do not first place yourself in that environment and pursue the path that you believe is a good one, instead of blindly following those around you. If collaboration and joint research are necessary to this process, then I would like to readily and aggressively incorporate them." Dr. Hamaguchi (JST President), Mr. Okimura (Counselor of the President), Dr. Ichioka (Senior STI Cooperation Strategist, Office of International Strategy OIS) , Ms. Hashimoto (Chief, OIS) and Mr. Yamamura (Chief, Dept. of Industry-Academic Development) attended the Council Meeting of the Science and Technology in Society (STS) Forum held at the National Center for Scientific Research (CNRS) in Paris, France. A workshop titled "Adapting to the Changing World Through Science, Technology and Innovation" was organized by STOA, STS forum and JETRO and held at European Parliament, Brussels on May 4th. President Hamaguchi gave a presentation in the session "Open Science in an Open World." The JST delegation also visited IMEC (Institut Mémoires de l'édition contemporaine) in Leuven, Belgium, in order to further understand state-of-the-art research trends in industry-academic collaboration. 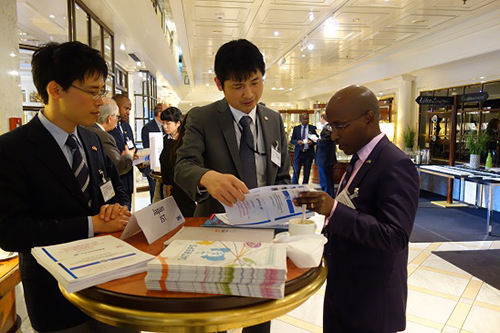 The Science Africa Conference & Workshop was held in Bonn, Germany on April 25th to 29th 2016, organised by the DFG (Deutsche Forschungsgemeinschaft) in close cooperation with South Africa’s NRF (National Research Foundation) and the SGCI (Science Granting Councils Initiative). Mr. Yakuwa (Dept. of Innovation Research) presented an overview on JST’s activities and explained the framework of JST Strategic Basic Research Programs as well as its research management processes during the two-day conference. At the subsequent three-day workshop, Mr. Ohama (Director, Office of International Strategy, Dept. of Strategic Planning and Management) introduced JST’s basic review criteria and activities of CRDS (Center for Research and Development Strategy) , an affiliated institution of JST. 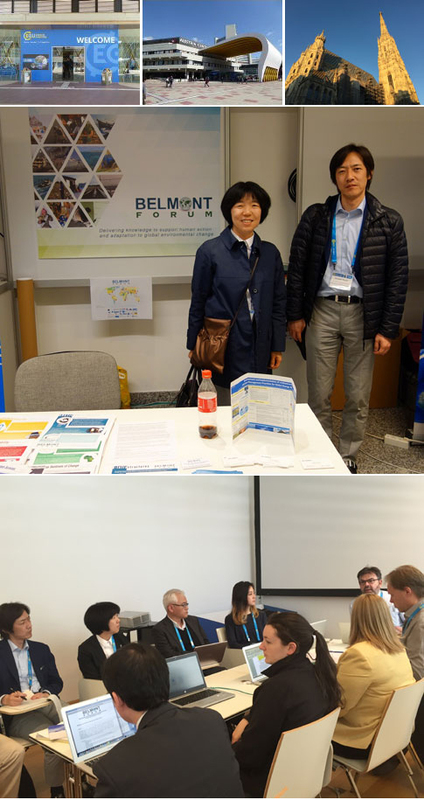 The Steering Committee (SC) meeting of Belmont Forum was held in Vienna, Austria on April 20, 2016 during the European Geoscience Union (EGU) General Assembly 2016 (April 17 to 22). Both events took place at the same location. The Belmont Forum has set up a booth for the first time and exhibited its activities. Steering Committee members from six countries gathered to review previous and ongoing activities and discuss future plans. JST was represented by Ms. Shirokizawa (Executive Director) and Mr. Tsuda (Director of RISTEX).